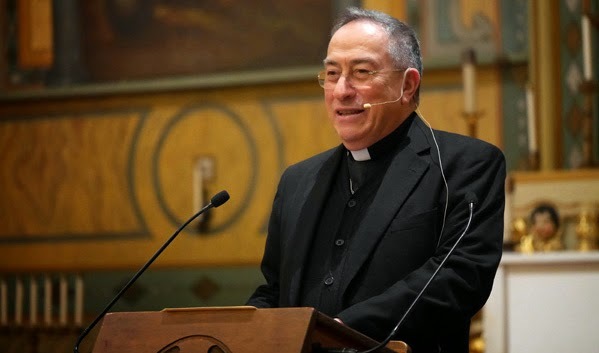 Last week, at Santa Clara University, at teh Markkula Center for Applied Ethics, Cardinal Rodriguez Maradiaga gave a talk on "The Church of Mercy of Pope Francis." He is an important figure these days, being not only the cardinal archbishop of Tegulchigalpa (capital of Honduras) and president of the Church's charity arm Caritas Internationalis, but also member and chairman of Pope Francis's special council of cardinal-advisors. His talk in the USA was therefore a notable Church happening. Santa Clara was good enough to publish the text of his essay. In the spirit of fraternal dialogue, I offer a thoughtful and, I hope, constructive response. The published text is in black, [with my comments in red, inserted]. The essay is somewhat long, so I'm breaking it into several parts, following the sections in the original. Here is Part One of my response. Fraternal love has its origins in God, who is Love and that loved us first. [Yes, quite so.] He spreads his love unto us, through the Holy Spirit [By what means? See below...], so that, in each of us, that love can grow, mature and resemble true love —the love with which Christ loved us. Sometimes there is the risk of focusing spirituality on other goals, other values, and not giving supremacy to the Beatitude of Mercy [“Blessed are the merciful, for they will be shown mercy.”]. This Beatitude teaches us that according to the Gospel, it is both solidarity and commitment of efficient love towards the brother in need and suffering misery, and the forgiveness of offenses and the reconciliation. [This paragraph is very good:] Regarding the commandment of growing in love, we must acknowledge that we do not know how to love. [Again, he’s invoking the reality of sin.] Our love is usually a caricature (Rom. 12: 9: “let love be genuine”). Our selfishness, our worries and our sensitivity take us over. Nevertheless we know that fraternal charity is the most difficult Christian and human realization: to be able to love as Christ loves us. [This is what we’re striving for in the whole of the spiritual life, and why we need constant recourse to the grace of the sacraments, and to deeper prayer.] We know that on Earth we will never reach the perfection of love; we know that we will continually fail, that we do not know how to overcome division and rancor, that every day we are timid in serving, in welcoming, in forgiving and in giving something of our lives for others. All this does not mean that we do not want to love or that in fact we do not love. Love is the way of love, to love is to want to love. What God asks of us, essentially, is not the success of charity but the permanent effort to grow in love and the struggle to learn to love, which begins every day. In the struggle to mature in love, the “human” and “evangelical” aspect of love walk together hand in hand, without ruptures or contradictions. There is no separation between human love and Christian charity. [True; but there is the distinction, already noted above, between natural and supernatural realities.] There should not be in practice a quandary between evangelization and social action born out of charity. The commandment of love that Christ gave us coincides with the vocation of man to grow affectionately, to give and give oneself above receiving and possessing. Jesus certainly has widened the horizon and the demands of love and has given it new motives and meaning. But his demands for evangelical charity take place and develop in the interior of human love, the emotional nature and the heart, though they are surpassed by the faith and action of the Holy Spirit. (For which fraternal love it is not always sensitive and gratifying). We learn to love following Jesus through love. Once more, he shows us the true practice of love, and communicates to us the light and life to be able to love like he loved us and to be able to evangelize as he did.